The Steve Guttenberg Project: Dr. Guttenberg to the ER - stat! Dr. Guttenberg to the ER - stat! Now, we're back to the Guttenberg as we know and love him. 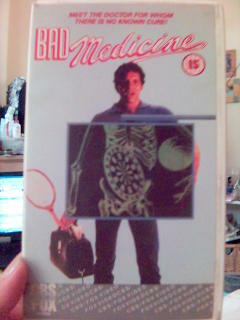 Also purchased in the great eBay binge of August 2005, we come across a pure example of Guttenberg gold. 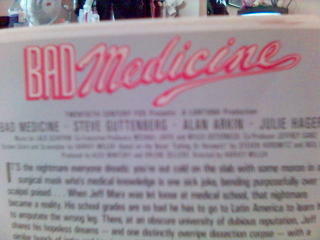 "Bad Medicine" is the touching tale of a young man in a family of doctors who can't get into any medical school in the United States, so naturally heads to some unnamed South American country to attend a dodgy medical school there. Does he win his dad's respect? Oh, you bet he does. Steve's character Jeff meets a delightful group of students from varying walks of life. There's the gorgeous former nurse who's just a little bit insecure, played by 80's comedy staple Julie Haggerty. The hilarious female character for a bit of contrast, played by Julie Kavner. The speed freak roommate, played by perennial crazy guy Curtis Armstrong. That guy from "Fast Times at Ridgemont High", played by Robert Romanus. But of this illustrious cast, who do we think gets top billing? Oh, that's right. It's a little someone I like to call Mister Steve Guttenberg. This is typical 80's comedy. Offensive, yet innocuous. Charming, yet irritating. Racist, .... well, it's a bit racist. There's no real upside to that. This is also the first Guttenberg film that I hadn't heard of that got the reaction of "oh, I've seen that one" from a friend.